When it comes to finding the best carpet cleaner in the industry, you have come to the right place. TruRenew Clean is the trusted and reputable company that you can count on for your carpet floor cleaning and other related services. It starts with the free quote and continues long after. Our Carpet Cleaning Company offers a level of professional grade cleaning that you simply cannot get from store-bought products, and even other local cleaning companies simply are unable to offer. With the newest state of the art truck mounted steam cleaning equipment, TruRenew Clean's cleanings leave your carpets looking cleaner than before, feeling better than you could have imagined and you will be able to breathe easier knowing the allergens are gone. TruRenew Clean uses the newest Evolution carpet wand that leaves your carpets dryer than most of the other stainless steel carpet cleaning wands and uses a Sapphire 370SS truck mounted machine to make sure that your carpets are only cared for by the best. *TruRenew Clean requests that when customers book a Basic cleaning that any furniture that the customer wishes to move is done so prior to the technicians arrival. Additionally, TruRenew Clean requests that the customer vacuum prior to the technician arrival. Should the technician deem it necessary to vacuum prior to beginning the job, additional charges may apply. *additional charges may apply, please speak with your sales agent when booking. *TruRenew Clean requests any furniture that the customer requests to be moved must have all items removed off the top or from inside prior to the technicians arrival. Otherwise we will be unable to move these items. Furniture that has electronics, china or anything of value on top or inside will not be moved due to liability reasons. Before your cleaning your technician will go over the benefits of carpet protector with you for your specific needs. Carpet protector not only protects from permanent stains or spills, but also from damage due to premature wear and traffic, as well as pet accidents. Most carpets are protected when they leave the carpet mill, however sometimes due to unforeseen circumstances during the manufacturing process, the protector is not always applied evenly or properly. Many carpet cleaners will aggressively sell carpet protector by convincing customer that their carpets need to be protected after each cleaning. At TruRenew Clean we know that if a high quality protector is applied properly by the correct professionals, then the protector can last up to three to five years, even with regular cleanings. Ask your technician about applying carpet protector to your carpets today. *Depending on the size of the area may increase or decrease the price. The Speed-Dry Service is a specially designed service which allows TruRenew Clean to return your carpets back to a dry enough state for normal use. 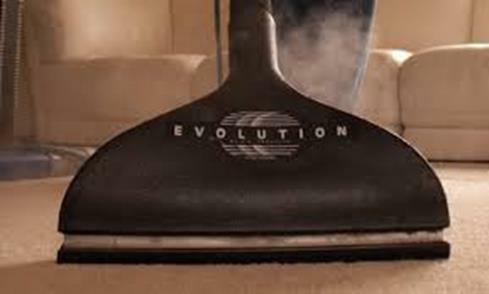 With a special setting on our machine and multiple slow passes with our Evolution Carpet Wand allows your carpets to be left feeling much dryer than a normal cleaning. Also by leaving drying fans on the carpets for a slightly longer period of time, allows the dampness in the carpet to evaporate quicker. In most homes, customers see results where the carpets are already dry to the touch when their technicians has completed the job. Ask your technician if our Speed-Dry Process is right for your home. Typically, our customers see a drying time of 3-4 hours. This can vary depending on the temperature setting and humidity inside the home. Our recommendation is to turn the air conditioner down just a touch to allow the a/c to pump out the humidity the carpet cleaning can cause to allow the dampness to evaporate. Are the products used safe for children, pets and the elderly? All of our products are safe, however if anyone is sensitive to any odors please advise technician prior to start of the job. It is recommended that you have your carpets cleaned at minimum once per year. However, homes with children, pets or heavy traffic, it is recommended once every three to six months. This is a great opportunity to take advantage of our TruRenew Carpet Cleaning Warranty. Can soon I walk on the carpet? It is always recommended to stay off the cleaned areas until completely dry, however we understand that is near impossible. Therefore, just be sure that you have on a clean pair of shoes or socks and you will not damage the cleaning. Be careful no to slip and fall when stepping off the damp carpets onto any hard surfaces, as it can be slippery. Most gray and black stains can be removed. However, stains that are brightly colored tend to have special dyes that may need special attention or cleaning solution to remove, but is not always guaranteed. Your technician will go over your areas of concern prior to the start of your cleaning. Your technician is only able to move furniture that has been cleared of any items on the top or inside. Due to liability reasons, anything of value that is breakable or has electronics on it will not be moved. Does your company have a minimum charge? 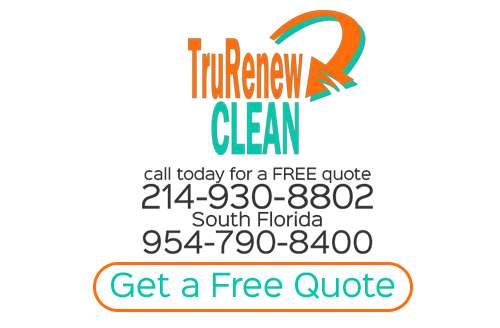 TruRenew Clean does have a minimum of $99 plus tax to service any home. Any service, whether a coupon or discount is being used must meet the minimum service charge. Do you only offer steam cleaning? No. TruRenew offers dry cleaning and encapsulation cleaning. However, most residential homes will see the best results with steam cleaning. If you are looking for Steam Carpet Cleaning in Plano then please call 214-930-8802 or complete our online request form.